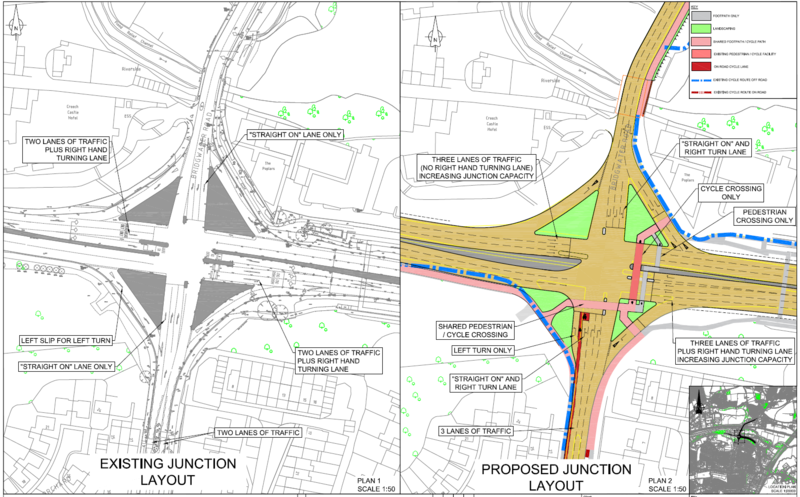 A consultation on plans to upgrade the busy Creech Castle junction in Taunton has been extended – with an extra public drop-in event arranged so people can see the designs. Somerset County Council has secured external funding and is developing a junction improvement scheme to ensure Taunton’s transport network can cope with planned future development. The Toneway is already heavily used as the main route linking the County Town to the M5 motorway. If improvements are not carried out, the Creech Castle junction will hinder planned development at Monkton Heathfield and impact on the strategic road network. The consultation will now close on Friday 30 November, with the additional drop-in event taking place on Thursday 29 November at the Britton Ash Community Hall, on the West Monkton Primary School site*, from 4pm until 8pm. Councillor John Woodman, Somerset County Council’s Cabinet Member for Highways, said: “These improvements will be of interest to a lot of people who drive through or live in the area, so it’s only right that we’ve extended the deadline to ensure everyone has chance to comment. Boost the economy in Taunton by supporting the delivery of planned employment and residential sites. Reduce peak hour congestion (compared with doing nothing) along the Toneway, improving access from the M5 to Taunton town centre. Reduce severance between communities on each side of the junction. The proposed scheme takes account of the clear geographic constraints in this location and increases the number of lanes through the junction to add capacity and improve traffic flow. It also provides improved crossing facilities for pedestrians and cyclists. The scheme is estimated to cost about £8m. A business case has been submitted to the Local Enterprise Partnership’s (LEP) Growth Deal fund for the majority of the money and the rest will come from capital funds, such as external developer contributions. This is money we are not allowed to spend on day-to-day running costs. To take part in the consultation online, please visit http://www.somersetconsults.org.uk or contact transportpolicy@somerset.gov.uk for more information. *BACH is located on the West Monkton Primary School site. The address is Bridgwater Road, Bathpool, Taunton, TA2 8FT.